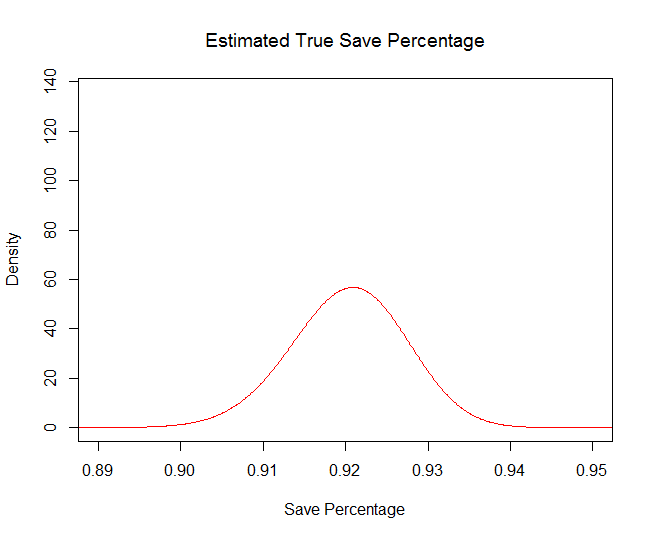 Save percentage (SV%) is a statistic that is commonly used to analyze goalies. 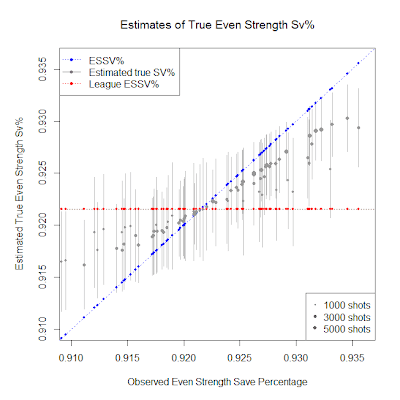 Analysts have started using even strength save percentage (ESSV%) instead, for various reasons. One reason is that there isn't much data for special teams, so it's hard to draw any conclusions about performance or ability on the penalty kill. Another is that a goalie doesn't control how many special teams situations he has to face, and so doesn't control how many special teams shots he has to face. 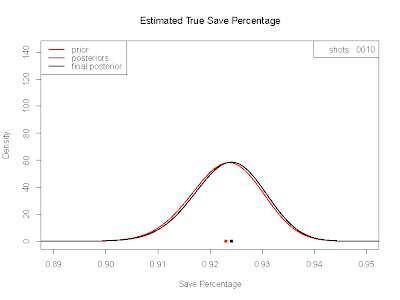 If a goalie's team takes a lot of (non-coincidental) minor penalties, that goalie will face a lot of shots on the penalty kill. 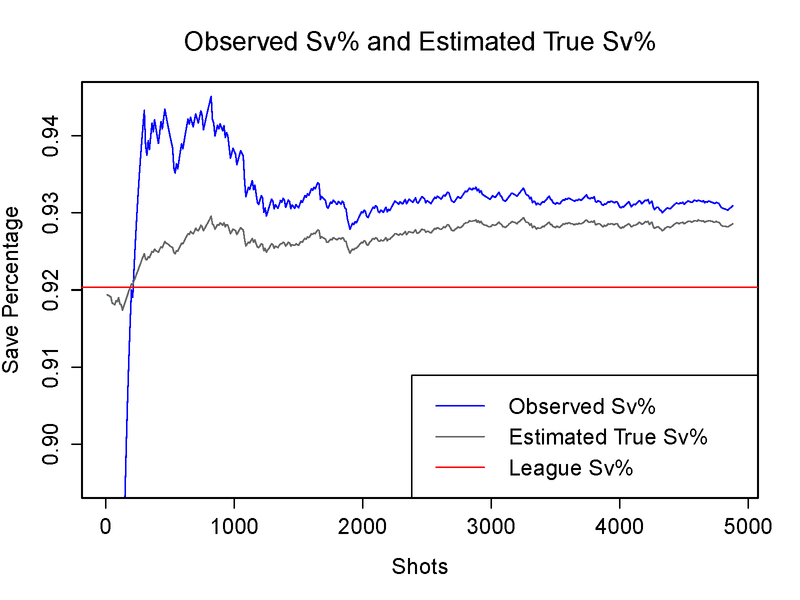 Those shots are tougher to stop, and this will tend to drag down the goalie's SV%. 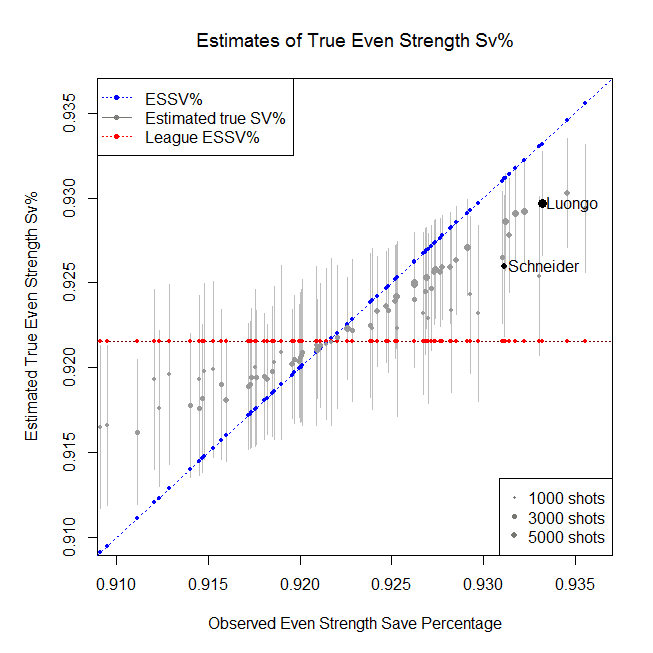 Even if he is one of the league's top goalies, his SV% may not reflect that because he is facing so many more short handed situations than the other top goalies in the league. ESSV% avoids all this. There are still a couple issues with ESSV% though. 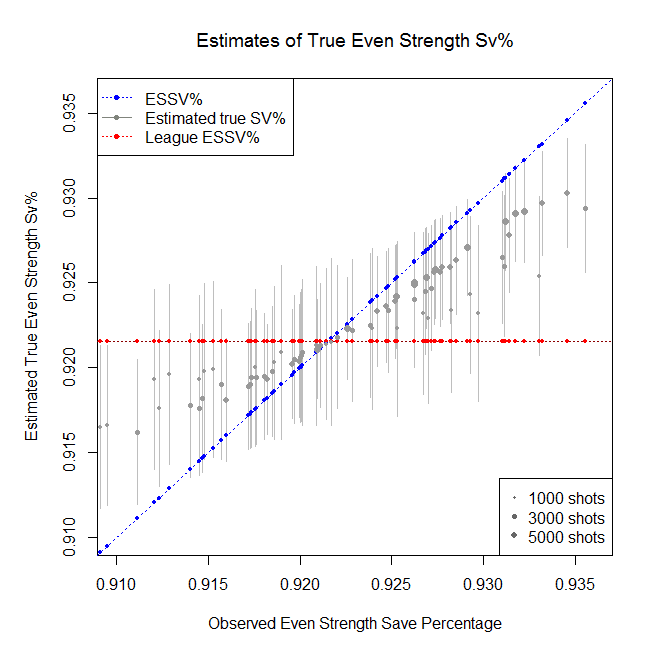 Problem 1: ESSV% still tends to be very inconsistent especially for goalies who have faced a relatively small number of shots. This has been noted by several analysts. 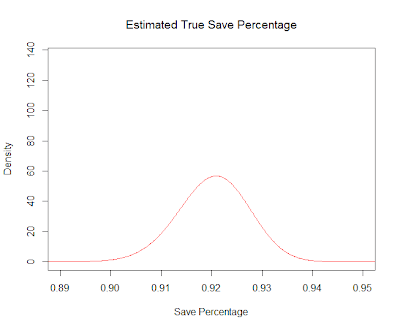 The top three results in a google search for “save percentage regression to the mean hockey” are a good sample of articles that discuss these issues, and why ignoring these issues can lead an analyst to draw questionable conclusions about the ability of a goalie or about the other players on a goalie’s team. See here for links to various places to buy the book. There are .pdf versions and paperback versions. As noted at that link, the cheapest paperback is available from CreateSpace using the discount code 7B8F3CZ7. It is $22.95 after discount. The .pdf version is $12.95. Hockey Prospectus 2013-14 is now available for purchase. See here for details on how to make said purchase. For those interested, I contributed to the BUF, OTT, and WPG pages. For WPG, I wrote about stuff related to realignment, and how WPG's travel will be affected. For BUF and OTT, I analyzed their goalie situations using a new technique. 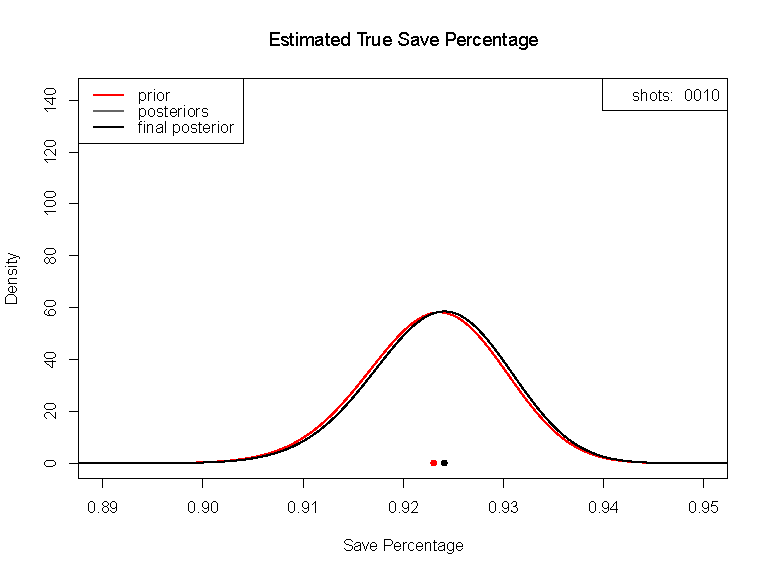 I'll write more about those techniques in a forthcoming post, but the basic idea is that the approach automagically regresses a goalies estimated true Sv% towards the league average, especially for those goalies who have faced relatively few shots. In Parts 1 thru 3, we developed a new playmaking metric that is (1) more consistent than assists and (2) better than assists at predicting future assists. @spamventura had an observation about the results that we'll study a little further in this article. Along the way, we'll give the top 10 PLAYers (capitalization and pun intended) from 2009-10, and how they did in 2010-11. In Part 2 of this series on a new playmaking metric PLAY, we talked about "altruistic contribution" based on shots. It is basically the difference in shots taken by a player’s teammates (excluding the player’s own shots) when he is on the ice versus off the ice. It’s kind of like a shot-based WOWY that doesn’t include the player's own shots. If a player's teammates take more shots when he is on the ice versus off the ice, his altruistic contribution will be high. Now we'll use this altruistic contribution to build our playmaking metric PLAY, and show that PLAY is better than assists in two quantifiable ways: (1) it is more consistent than assists, and (2) it is better than assists at predicting future assists. Part 1 of this series on a new playmaking metric PLAY, we gave an overview, and discussed marginal contribution, which is basically some form of WOWY. See here for Part 1 and here for the full paper. In this part, we'll discuss competitive and altruistic contributions. Altruistic contribution is what we'll use to compute PLAY. 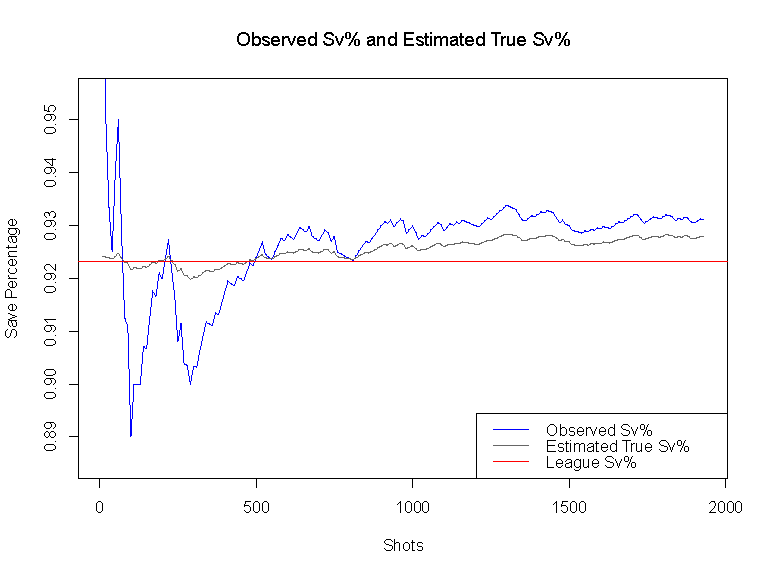 I wanted to share a recent project I did with friends and colleagues Chris Weld and Chris Arney titled "Quantifying playmaking ability in hockey". The one sentence summary is that we developed a metric for quantifying playmaking ability in hockey that is better than assists in two quantifiable ways: (1) it is more consistent than assists, and (2) it is better than assists at predicting future assists. In this article, we'll give an overview of what we're doing, and the motivation behind it.